I’ve been two weeks with my family in Missouri and Minnesota and North Dakota and what a time of re-acquaintance it has been! With a trip or two to the store with my parents once I arrived in Missouri, most of the items needed to set up my van for the year-long trip was obtained. My nephew created a “redneck” air conditioner for his garage and so one is also being made for my van (gallon jug of ice water, insulated 3-gallon bucket and a fan!). It should make traveling to Portland, OR to move my niece up there in August much more bearable! It was a great time in Missouri getting to see my brother Kenny and his family. We went to Six Flags and I rode roller coasters galore for the first time in 3 decades! It was a beautiful day with hardly any lines to wait in! I even managed to get in a day of golf with my brother Dan and his boys (Logan and Clay) as well as my brother Kenny and nephew Austin. I sooo much more enjoy golf when it is “best ball”! That day broke a 3 decade long drought on golf, but I’ve been playing every week since then! Then mom, dad and I headed up to Minnesota/North Dakota. I hooked up with my uncle Kim and Aunt Vickie for the first time in 3 decades too (what have I been doing for 30 years anyway?!). It was great to be reacquainted with them and their son and grandson…the Dereks. The next day we went to my mom’s family reunion in Hickson, ND…the Davenport reunion. 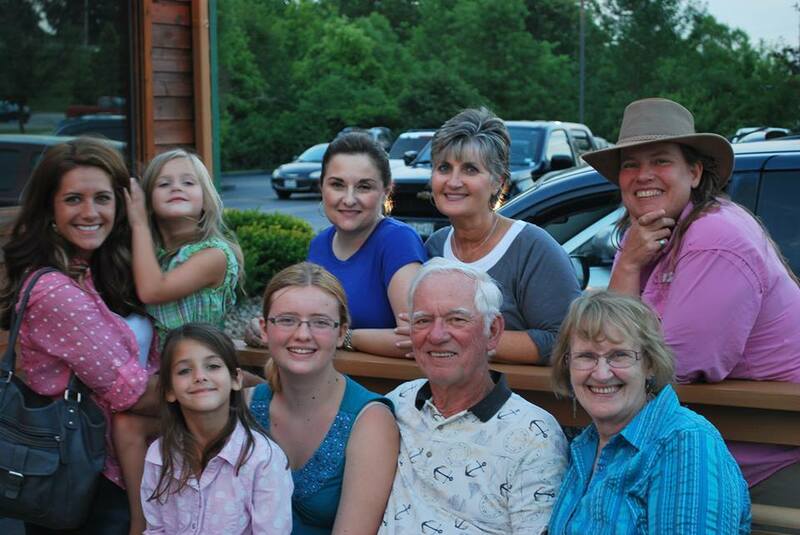 It was good to meet family I hadn’t seen in…you guessed it…3 decades! It was a pleasant mild-mannered time of dining and getting reacquainted. They had a raffle at the end of the day and my name was drawn for the grand prize which was everything a person needs to cook around the camp fire! Boy did I hit the jackpot as it helped prep my van even more for a year of camp fires surrounded by the beauty of the national parks! 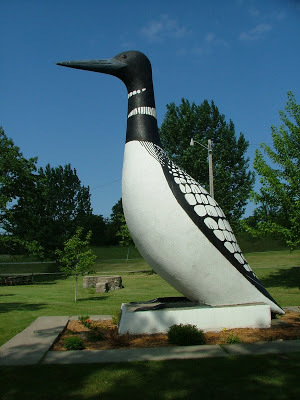 Vergas, MN…the town with the largest loon…and some of my uncles and aunts! After leaving the reunion, we stopped by and visited my uncle Kevin and Aunt Bonnie. It always feels a little odd when folks ask “so what are you doing Debbie?” To not respond with some noble world-changing or success-producing vocation. “Oh, taking a gap-year of sorts and traveling around the 48 states and national parks.” But as it turns out there really are a lot of folks who would like to do that very thing…if only life circumstances would allow for it. It just confirms for me, that since my circumstances seem to be allowing for it, as it were, it’s a good time to get out on the road and experience Hosea 2:14-15a under the grandeur of America’s best wildernesses! Well on to the story. After I told my uncle and aunt of my intention, they informed me that they had a 1981 motorhome they would like to give me. They just a bought new one (where the bed wasn’t over the cab) and was looking to sale the old one. Well, though I did not have to pay a penny, I certainly had the jitters of a first-time home buyer. We took a tour of it and started it up and talked about all the things it needs and doesn’t need. (It’s a fixer-upper for sure, and yet, a vehicle/home with gobs of potential!). 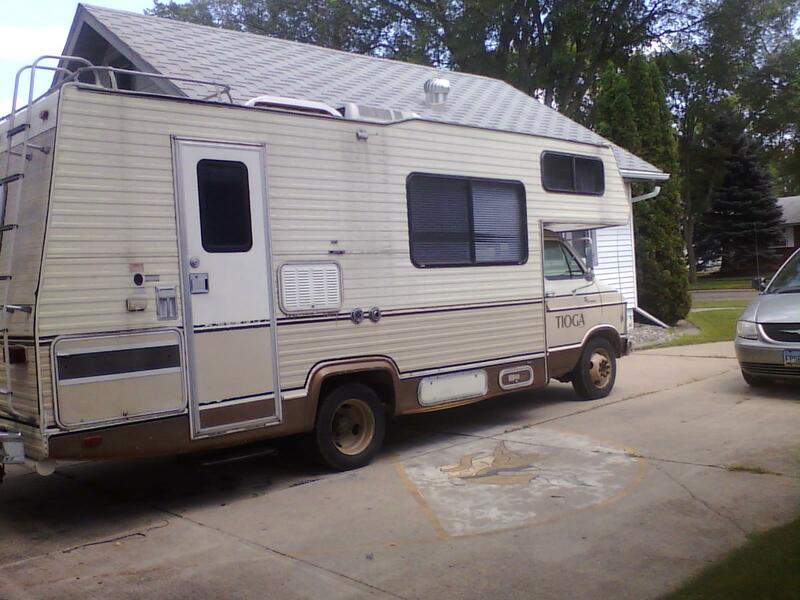 1981 Dodge Sportsman Tioga Fleetwood Motorhome…for free…of sorts! My mom and dad were with me. And of course my kind-hearted father is not the least bit interested in this trip of mine. Each time I mention it all he hears is “Danger!” “Weirdos!” “Middle of Nowhere!” etc. And yet he bears with me as I attempt to regal him with my route and plans (and again, all he hears is “assault!” “attack!” etc). My caring pop spent time to show me how to use wasp spray but I believe that it is illegal to use it for self defense, so I think I will use non-poisonous pepper spray! But they were there while my uncle Kevin was telling me all the ins and outs of this vehicle…the number one item being half of the tires need to be replaced. That would be THREE tires…THREE odd sized tires of 16.5”. And we are talking about a VERY old camper…33 years old! It rivals even Pat Spurlocks old Coleman grill she gave me! I was wondering should I really undertake such a responsibility…it is so anti-my motto of minimalism. I also knew I could never afford three new tires like that at this moment in my financial history. And though it was really a generous gesture on my uncle’s part, I couldn’t really imagine the ability to afford such a critter at this time right now. 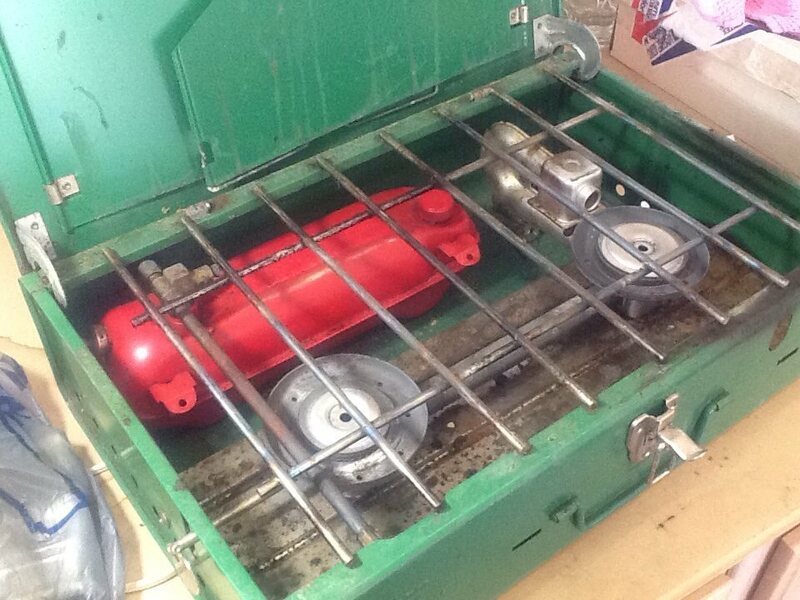 41 year old Coleman 2-burner stove from Pat! Well, my pop has offered to get the three tires. And at the very least we will take it down to Missouri and have a go over of it. 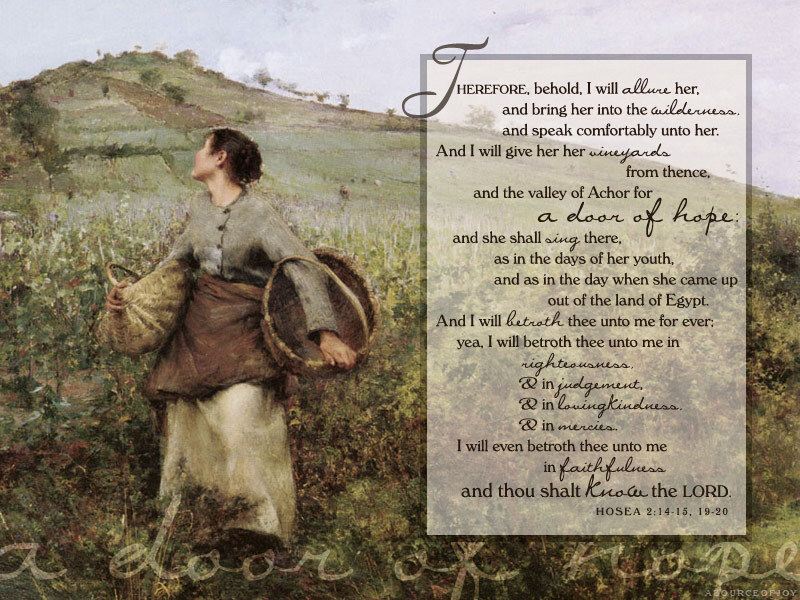 (God willing—James 4:15). Whether it is the vehicle I take on the year-long trip has yet to be determined. But it has such “tiny house” potential that I could not just leave it in my uncle’s driveway to be neglected! The home on the chassis is a 24’ Tioga Fleetwood. There is an extra battery under the stairwell that is recharged using the vehicle’s alternator (if this classic seems keepable I wouldn’t be able to stop myself from checking out solar panel possibilities). This would charge all laptops, monitors, lights, and chargers (and perhaps the water pump). Basically it would run my “home office” unless I am somewhere that is connected to land electricity. A helpful diagram of how the whole home system is to work…with solar panels! There is a place for a generator, with wires all hooked up and what not, to keep the refrigerator and a/c system going if necessary. But a generator does not come included in this free gift! But it may not be needed while I’m traveling in it and would perhaps hook up to land electricity when parked. All to be seen I suppose. 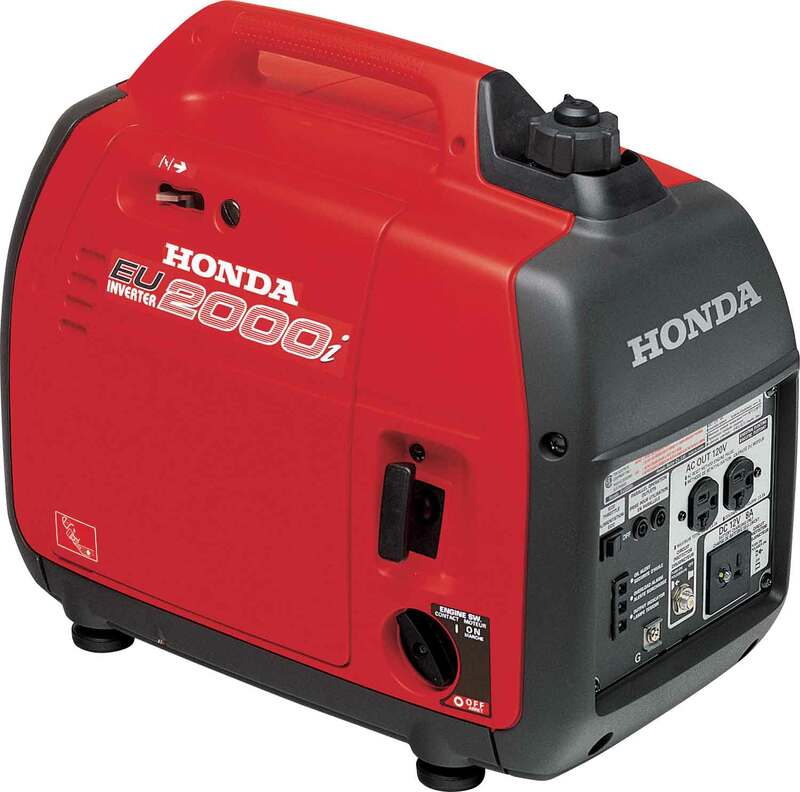 A really quiet Honda generator! Now the water tank is made out of plastic and is very brittle and broken. It will require replacement of some sort. 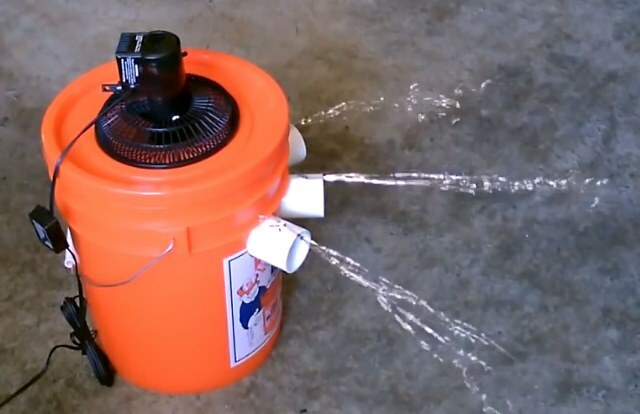 The water tank would feed into (or a direct connect to a garden hose from a house or rv spot) the water heater, the kitchen sink, the shower, the bathroom sink and toilet. It all gets drained into a holding tank underneath the camper and gets dumped at a dumping site. As far as the living room, dining room, bedroom area…there are two beds, and two chairs and a table/desk, without any conversion necessary. One of the beds can be converted into a couch and a table the length of that couch can be added as well. There is a queen size bed above the cab (which made aunt Bonnie claustrophobic) and then a twin bed on the floor level. Well, I could go on and on about it because I have plenty of time to sitting here in the back seat as we travel from Fargo, ND to Detroit, MI! But I will spare any more details from my excitement about this whole venture. I suspect we will know more as my parents and I come back to ND after the Lein reunion to reassess this thing more closely in my uncle’s driveway! But hopefully by the end of the month of July we will be tootling down the road to St. Louis to hook up with my van. And figure out what to do about that 2-vehicle situation once I get there!